Welcome to our Basildon paintball site, based at Wickford SS11. Perfect for kids and adult paintball in Basildon and surrounding areas. By offering .50 calibre paintball for adults and Splatmaster for younger kids we have a game for every age from 8 years upwards. Our Basildon Paintball site offers adult paintball to all ages from Secondary school age and older. It’s a great game is great to get the adrenaline pumping. Gas powered weapons and an exciting range of paintball zones make this an amazing game for groups of all sizes. Adult paintball is ideal for all occasions and we welcome stag dos, hens, corporate days and sports teams. Costs are £30 inc 500 or £40 inc 700 paint. Additional paint is just £6 per 100. We also offer a massive 1200 package for £50 or 2000 package for £90. Please note these differ costs from other sites. 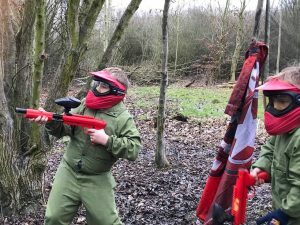 Kids paintball is great fun and only made possible by new Splatmaster, low impact, pump action weapons which recently came onto the market. Our kids paintball is played in the same zones as the adult game but in a slower more controlled manner. Making it safer for our younger players. We even have a heated safezone room for food after your party. At Basildon we offer 2 packages. £250 for up to 10 kids. This is a 1 hr session with food supplied by you. Additional children at just £25pp. You can use our party room for 30 minutes after your game. Total time on site 1.5 hrs. £300 gives you up to 10 kids for 2 hrs which includes food provided by us. Additional children can be added at just £30pp. They play for 45 minutes, stop for 30 mins for food, then play the final 45 minutes. Both packages include unlimited ammo. We have a number of exciting play zones and new ones are coming soon. We have containers, wooden buildings, barrels and hay and trenches. Our fields are packed with exciting barricades and obstacles adding feeling of paintball fun and danger. Our zones include: Checkpoint Charlie, Trench Warfare and our Barrel ‘toxic waste’ field. We even have a specially designed low impact zone. All pictures on this page are from the Wickford site and there’s more to come. We require a deposit of £5 per player for all games. PLease note deposits are non refundable for any players who don’t show up on the day. Calls are charged at local rate and included in mobile minutes. You can visit our Basildon paintball address page directly here. 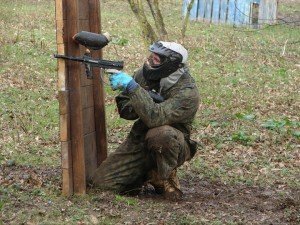 This site is ideal for people looking to play paintball Chelmsford and Basildon and offers easy access by road from most of Essex.